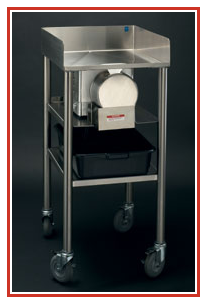 The Model 900 Prawnto Processing Station is NSF listed and can be used with any of the processors. 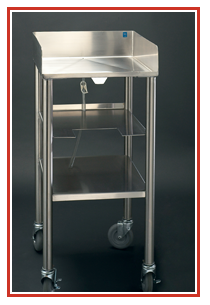 It is made of 300 Series stainless steel and is welded to make it extremely solid. It is ready for use out of the box. It is 21" H x 20" W x 42 L" tall and holds 20+ pounds of shrimp. 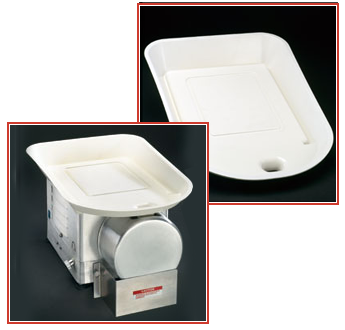 It comes complete with a large and small funnel, top-shelf drain and uses a standard bus tub (not included). The Model 600 Speed Pan fits all three Prawnto SHRIMPERFECT™ models. It nests on top of the machine and has a built in funnel. The pan is capable of holding up to 10 pounds of shrimp at one time.